Today's heat and steam made up for all of the coolness of the previous fair days. We are all still recovering from the crock-pot weather this evening! 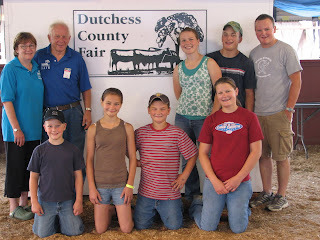 Of course the weather did not prohibit enjoyment of some special events at today's Dutchess County Fair. (1) Lenny and Melody, organizers of the Salute to Agriculture Tent, generously continued their gracious tradition of inviting all of us Angell children to breakfast at Blondie's. For most of us it was our first taste of "fair food." What a treat! 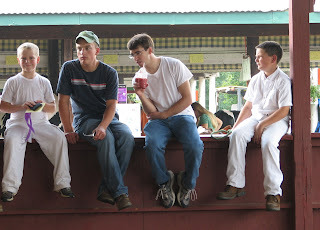 (2) We were joined once again by Justin, Nate's friend from Princeton, for the morning cow shows. He joined the 4:15am team and pitched in with the intense morning chores at the fair. (3) And last, but not least, today proved to be another huge day for Jacob. Jacob won first place in showmanship for his division at today's competition! This is such big news for the Bentley Farm Gazette, that a video from today's competition is shown below. The judge commented on how nicely Jacob and his cow travelled together. It looked to me like a dance! Caleb (third in a class of twelve), Rebecca and Hannah also were judged in showmanship today and should also be applauded for their hard work and dedication throughout the summer that made the moments of today possible. I am a proud sister!